Place asparagus in a steamer basket over boiling water. Cover pan and steam 5 minutes, or until bright green and almost tender. Drain, rinse under cold water and rinse again. Heat oil in a heavy saucepan over medium high heat. Sauté pine nuts 3-5 minutes, stirring constantly, until lightly browned. Transfer pine nuts in oil and next 4 ingredients to a blender or food processor and process until smooth. 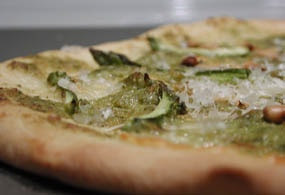 Spread pesto over crust and top with asparagus, pepper, mozzarella and Parmesan. Place pizza on an oven tray and bake 15 minutes, or until topping is golden brown.